Sure, it would be great to pick up a Radio King with its highly sought after solid maple shell. But having read that Neil's "Ol' Faithful" Slingerland maple snare was actually an Artist model, I decided to broaden my search. The Artist was available with the same solid shell as the Radio King until the early 1970s, and then shipped with the 3-ply maple-poplar-maple shell also found in Slingerland's Hollywood Ace and Deluxe Student models. There is some debate as to whether Neil's Artist had a solid shell or a 3-ply shell, but it was likely a 3-ply. As a result, I decided that any of the above models at a good price would be a worthy addition to my snare drum arsenal. I have never been a fan of the 5-ply shells Slingerland offered later in the 1970s, so I avoided those drums. Two weeks ago, I stumbled upon a Deluxe Student model at my local Sam Ash store. This fine example of Slingerland's Sparkling Red Pearl finish caught my attention when I saw the black and brass Niles badge. According to the date stamp inside the shell, this drum was manufactured in February 1964, and it was in excellent condition, particularly for a 50-year-old drum. It appeared to be all original, including the chrome-over-brass hoops, 12-wire snares, tone control, throw, and Slingerland concert heads. The finish was in amazing shape and there was no separation in the shell plies or re-rings. Sam Ash priced the drum at $250, and while that is a bit high for this particular model, I had never seen an early 60s, all-original example in such good condition. I decided to pick it up. Slingerland manufactured this iteration of the Deluxe Student model snare drum from 1963-1976. As you can see at the bottom of the 1964 catalog page shown here, the Deluxe Student model featured the 3-ply maple-poplar-maple shell with re-rings, chrome-over-brass stick saver hoops, tone control, the basic but functional "Rapid" throw, and six Sound King lugs. The Hollywood Ace model pictured directly above it is identical except for its eight lugs, 16-wire snares, and a 7-inch deep shell option. 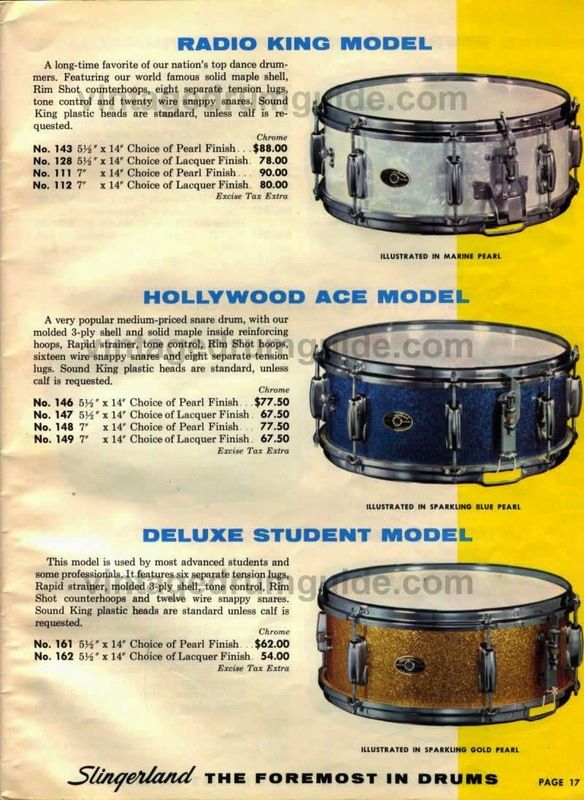 Slingerland charged 1964 Hollywood Ace buyers a whopping $15.50 premium for the two additional lugs, 8-hole hoops instead of 6-hole, and four additional snare wires! Slingerland's classic Radio King model is shown above the Hollywood Ace. The only other wood snare in the 1964 catalog, the Artist model, not pictured, shipped that year with a solid maple shell, 20-wire snares, and the Zoomatic throw. The Artist was actually $2 more expensive than the Radio King in the same 5.5x14 size. For an additional $5, you could order an Artist snare with ten lugs instead of eight, an option that was not available on the Radio King. I was a bit surprised to find that the Artist, not the Radio King, was Slingerland's top-of-the-line wood snare drum during this time period. Who says you have to slow down after 50? Speaking of lugs...since my new drum is a Deluxe Student model, it has only six lugs to tension each brass hoop. Knowing that brass is a bit softer than steel, I immediately wondered whether fewer lugs and softer hoops would affect tuning. In other words, should I have held out for a Hollywood Ace, Artist, or Radio King with at least eight lugs? But before we get to tuning, let's talk upgrades. Since I'm not starting a drum museum (yet), this will be a player's drum. So--I removed the original heads and snares and stored them for future restoration. Evans G1 coated batter and Hazy 300 snare side heads are good choices for any snare, especially vintage snares, and they dropped right on the vintage shell--a good indicator that the shell is still round. I also replaced the original 12-wire snares with 16-wire Puresound Custom snares. Tuning the 6-lug snare with Tune-bot was slightly more of a challenge than with 8- or 10-lug drums. It does appear that the wide spacing between the lugs results in a bit of flex in the brass hoops, so Tune-bot lug frequency readings showed a bit more variance if I tapped more than than an inch to either side of a lug. I also noticed that tension changes at one lug had more significant impact on tension at the other lugs. However, as long as I brought the tension up evenly across the drum, it was only slightly more touchy from a tuning perspective. As always, be sure to check out my "Tuning drums with Tune-bot" post, especially my Top Ten Tips for Tune-bot Tuning. These tips provide general guidance that will help you avoid common drum tuning issues and get the most out of your Tune-bot. Once again, a vintage drum really impresses me with its tone and playability. If you haven't played a vintage Slingerland maple snare, I highly recommend it.